The Engage series is categorized by Bushnell as an affordable tactical and hunting scope. There are 2 tube size for you to choose from, 1 inch and 30mm. The Bushnell Engage has somewhat mixed reviews of both super positive and outright bad. Even though each person eyes are different from one another, the difference is markedly intriguing. Some people claim Bushnell Engage is similar to Vortex Viper rifle scope and would be more happy to buy more. On the other hand, some claim Bushnell Engage’s quality is so bad that they would rather get Vortex Crossfire 2 instead. So, which is true? And should you get yourself a Bushnell Engage? 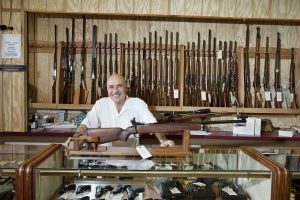 As an optic enthusiast, my experience tells me that scopes with bigger tube diameter tend to perform better than smaller tube scopes of the same make. However, Ron from Swarovski Optik says that bigger housing contributes just a small portion to improved quality. This is probably true as you can see Swarovski and NightForce 1 inch scopes outperforming lesser brand’s 34mm optics. But my experience with Bushnell Engage makes me doubt Ron’s theory again. 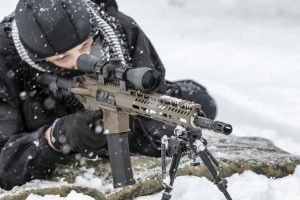 In this article, I’ll be reviewing Bushnell Engage 4-12×40 (1 inch) and Bushnell Engage 4-16×44 (30mm) as representatives of the 1-inch and 30mm models respectively. 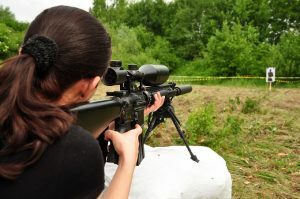 A quick summary of this article : I’m happy with Bushnell Engage 30mm scope for range and target shooting. It’s better than Vortex Diamondback Tactical with the same specs. Reticle is a bit too fine for hunting in low light, but is great for target shooting. Turrets track well but should add more internal adjustments to make it suitable for long range applications. On the other hand, I am unsatisfied with Bushnell Engage 1-Inch models. These should not share the same name with Engage 30mm. Glass are bad and I’d happily trade it over with Vortex Crossfire 2 as it is a much better scope. Best for : Shooters who want a quality, yet affordable scope with fine MOA reticle for target shooting (30mm only). Since no optics nor products exists in isolation. And words such as “crisp” and “great” glass don’t really mean much when you have no benchmarks. I’ll be comparing the Bushnell Engage with other rifle scopes in similar price range, so you know what’s the best option for your money. Read on to find out why the Bushnell Engage, even though impressive, isn’t a perfect scope. These are 2 popular options in the market with similar price point and should give you a realistic feel of how good the Bushnell Engage really is. To determine the Bushnell Engage’s performance, I lined the Engage 30mm, 4-16×44 alongside the Vortex Diamondback Tactical 4-16×44. For another group I put the Engage 1-Inch, 4-12×40 with the Vortex Crossfire II 4-12×44, 1-Inch, AO. Engage 30mm, 4-16×44 : Comparing head to head, the Engage 30mm is the clear winner by a wide margin. Glass is markedly clearer than the Diamondback Tactical. Engage’s eyebox is also much more forgiving. During dusk, Bushnell Engage does give a brighter and more vivid, contrasting sight picture. Engage 1-Inch, 4-12×40 : Surprisingly, Engage 1-Inch glass is much worse than the entry level Vortex Crossfire 2. Glass is not clear, image not crisp. Glare is present and light transmission is unimpressive. It is hard to believe that this is the same scope series as the Engage 30mm mentioned above. With this quality, I’d go with the Crossfire 2 anyday. Cheaper and better glass. Engage’s turrets are offered in only MOA adjustments, and this caused one of my friend to quickly dismiss the Bushnell Engage series, because he was looking for a MIL/MIL scope. Engage 30mm, 4-16×44 : Bushnell Engage 30mm turrets are finger-adjustable target turrets with zero reset and turrets lock features. Turrets are high profile and do not come with caps. That said, you don’t have to worry about accidentally adjusting them during your hunt, because the turrets are locked. You need to pull its knob up before making any adjustment. Yet snagging might still be an issue for hunting. Both the Engage 30mm and Diamondback Tactical turrets pass my 5 MOA box test. I’d say that they track true and should work for your tactical and long range shooting. Diamondback Tactical turrets are also high-profile, without caps and has zero reset but no turrets lock feature. You get 50 MOA internal adjustment for all Engage 30mm series and 85 MOA for Diamondback Tactical. Note that Bushnell Engage 30mm 6-24×50 also has only 50 MOA internal turrets adjustment. This is considered quite lacking if you’re into long range shooting. Engage 1-Inch, 4-12×40 : Bushnell Engage 1-Inch turrets are finger-adjustable low profile turrets with caps. 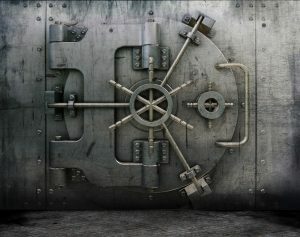 The turrets are zero resettable, but have no turrets lock features. Both the Engage 1-Inch and Crossfire 2 turrets do not track well. But that’s pretty much expected at this price point. I get what I paid for. Crossfire 2 turrets are also low-profile and come with caps. Crossfire 2’s feature is the same as zero reset is present but no turrets lock feature. 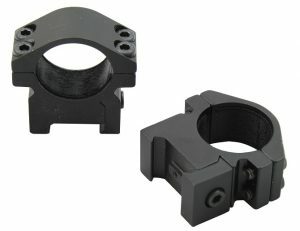 You get 60 MOA internal adjustment for the Engage 1-Inch 4-12×40 and 85 MOA for Diamondback Tactical. Note that Bushnell Engage 1-Inch 6-18×50 also has only 40 MOA internal turrets adjustment. This is considered quite lacking if you’re into long range shooting. One thing to complain about Bushnell Engage is its lacking of reticle options. 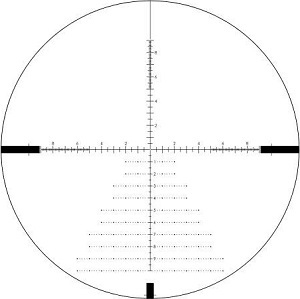 There’s only 1 option : Deploy MOA reticle. If you appreciate fine MOA hashmark reticle, then you’re good to go. However, if you’re a fan of no-clutter reticle, you’d be sorely disappointed. For Diamondback Tactical, you can choose between MOA or MIL BDC (These are Christmas Tree style). For the Crossfire 2, you get to choose between BDC, Duplex and Illuminated-Duplex. 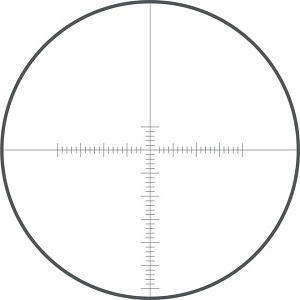 Bushnell’s reticle is very fine. It could be hard to see especially in dark and low light background, thus I don’t think it’s that great for hunting. Explore parallax and focal planes set up of Bushnell Engage and benchmarks. I prefer side parallax knob design as it is easier for me to adjust. If you’re serious about long range shooting, I recommend that you get First Focal Plane scopes. If not, either would do fine. Bushnell Engage comes with flip-up front and rear lens caps. The Engage series are lighter than Vortex’s. Personally I have a great run with my Bushnell Engage and have experience no durability issue after around 300 rounds down range. Bushnell also offers Lifetime Warranty, even though not as reputable as Vortex’s. It is stated in Bushnell’s website that the Engage 30mm series have stronger housing than 1-inch models. I’m happy with Bushnell Engage 30mm scope for range and target shooting. It’s better than Vortex Diamondback Tactical with the same specs. 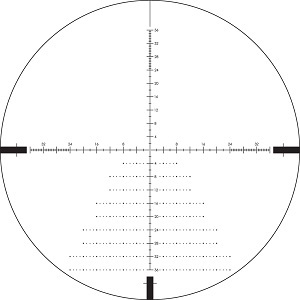 Reticle is a bit too fine for hunting in low light, but is great for target shooting. Turrets track well but should add more internal adjustments to make it suitable for long range applications.